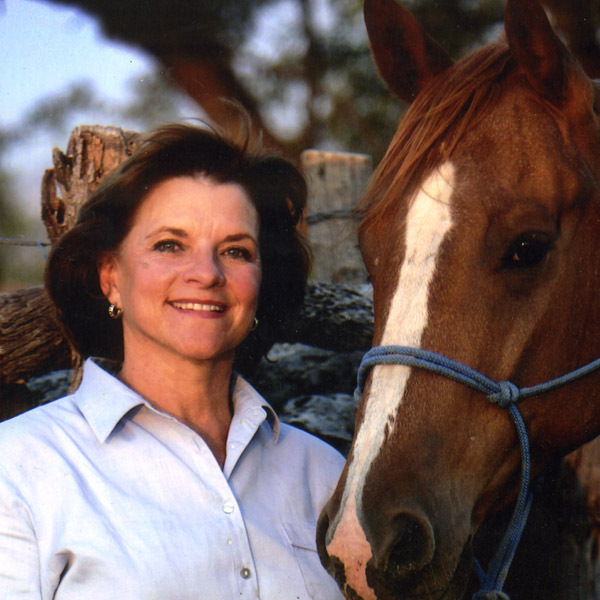 Deborah Copenhaver was born and raised on a cattle and Quarter Horse ranch in northern Idaho. Her father, a World Champion Bronc Rider, supported the family with his winnings. She and her younger brother Jeff grew up on the ranch often alone with their mother. Work on the ranch was shared by all, and a life long passion for horses grew from those responsibilities. It was at this time that Deborah sold her first drawings of horses. Competition was a way of life for the Copenhaver family. Deborah won barrel races before she was a teenager and was a member of the Girls Rodeo Association. She had her first race horse at twelve. Her brother Jeff roped calves and won calf roping competitions at an equally young age. Deborah spent her first year of College at Washington State University where she earned a full scholarship. That same year Deborah won the competition to become Miss Rodeo Washington and was Runner Up Miss Rodeo America. Her second year of college she transferred to Fort Wright College of the Holy Names in Spokane Washington. Here she met a nun, Sister Paula Mary Turnbull, who taught sculpture. Deborah received a Bachelor of Fine Arts degree with a Fine Art major following study in Italy where her passion for sculpture came alive and continues today. At 19 she sculpted her first commissioned bronze for the city of Spokane, James Glover. She successfully owned and operated her own business Classic Interiors; an experience that honed her business skills. Despite her success in the business world, the horses called... She and her brother loaded their horses and left Washington to compete in the winter rodeo circuit .By the second go round of Houston and no winnings, Deborah loaded both horses and headed for Phoenix with just enough money to get to a friend’s ranch in Chandler. During this stay she went to Prescott and met Ernie Phippen who ran a western art foundry. Her world came together. She went back home gathered all of her belongings and returned to Prescott to get a job as a head wrangler in a dude ranch. That year she cast her first bronze... and started her art career ....Jeff won the last go-round at Houston and went on to win the World’s Championship. Within four years Deborah was commissioned by Gonzaga University to sculpt a monument of Bing Crosby. The project took her to Queen’s New York, to Roman Bronze Works, the foundry that cast bronzes by Charlie Russell and Frederick Remington’s bronzes. This was the first of many monuments that she would create. It was during this period Deborah married and had her only child, Fabienne. “My greatest life’s accomplishment,” according to Deborah. In the post Vietnam era Deborah won competitions to create veteran memorials including the Inland Northwest Vietnam Veterans Memorial ,Montana State Vietnam Veterans Memorial and the Washington State Korean War Memorial. She also received commissions to do monuments of Henry Kaiser, James Irvine, Frank Erwin of the University of Texas and created a monument for The Boy Scouts Of America. In the last decade, Deborah’s life and career have reached new heights as she has returned to her original inspiration source, the American West. Living now in southern Arizona with her husband Fred Fellows, Deborah is devoted to creating fresh, original and accomplished sculptures which express her heartfelt feelings for the Western way of life. Surrounded by splendid Southwestern scenery and a string of good horses, she is assured an ample source of inspiration for a lifetime. 2001	“Tribute to Ranching”, Santa Cruz Fairground & Rodeo Assoc.